Background: Alzheimer disease (AD) is characterized by progressive cerebral atrophy that may be measured using MRI. Reported are MRI findings of a Phase IIa immunotherapy trial in AD prematurely terminated owing to meningoencephalitis in a subset of patients. Objective: To assess cerebral volume changes in patients immunized with AN1792 (β-amyloid [Aβ] 1 to 42) who were antibody responders (anti-AN1792 IgG titer of ≥1:2,200) compared with placebo patients. Methods: This randomized, multicenter, placebo-controlled, double-blind trial of AN1792 225 μg plus QS-21 50 μg included 372 patients with probable AD. Patients received one to three injections of AN1792/QS-21 or saline and were assessed for 12 months. Volumetric MRI was performed pre dose and at month 12 or early termination. Brain, ventricular, and hippocampal volume changes were measured from registered scan pairs. Results: Two hundred eighty-eight patients had paired scans (mean interval 10.9 months). Antibody responders (n = 45) had greater brain volume decrease (3.12 ± 1.98 vs 2.04 ± 1.74%; p = 0.007), greater ventricular enlargement as a percentage of baseline brain volume (1.10 ± 0.75 vs 0.48 ± 0.40%; p < 0.001), and a nonsignificant greater hippocampal volume decrease (3.78 ± 2.63 vs 2.86 ± 3.19%; p = 0.124) than placebo patients (n = 57). Increased losses in brain volume were not reflected in worsening cognitive performance; a composite z score across a Neuropsychological Test Battery showed differences favoring antibody responders over placebo (0.03 ± 0.39 vs −0.24 ± 0.45; p = 0.008). Conclusions: A dissociation between brain volume loss and cognitive function was observed in AN1792/QS-21 antibody responders. The reasons for this remain unclear but include the possibility that volume changes were due to amyloid removal and associated cerebral fluid shifts. Alzheimer disease (AD) is characterized histopathologically by the accumulation of amyloid plaques and neurofibrillary tangles and by neuronal loss manifested at a macroscopic level by increased rates of cerebral atrophy. Although these changes may initially be concentrated in the entorhinal cortex and hippocampus,1 they are usually already widely distributed throughout the cerebrum by the time of diagnosis. AD is the commonest cause of dementia and represents a pressing public health problem as well as an important therapeutic target. Although the development of symptomatic treatments for AD has been a major advance in its clinical management,2 there are currently no interventions that can modify the course of the disease. Thus, achieving a clinically meaningful slowing of disease progression is the next and crucial challenge in AD. Improved understanding of the pathophysiology of AD and the development of animal models have stimulated a number of drug development programs to meet this challenge. We report here the results of MRI measures of hippocampal, ventricular, and brain volume changes in a trial of aggregated human β-amyloid (Aβ) 1 to 42 (AN1792) immunotherapy in AD; clinical outcome measures are reported elsewhere (S. Gilman et al., unpublished). This study was originally designed with two primary efficacy endpoints: change in whole-brain volume as determined by MRI (planned at 0, 12, and 15 months) and cognitive change as measured using the Alzheimer’s Disease Assessment Scale–Cognitive Subscale (ADAS-Cog). The study aimed to compare patients on placebo with those patients who developed a predefined antibody response to AN1792 after immunization. However, the active dosing phase of the trial was terminated early because of the development of meningoencephalitis in a subset of patients.12 The protocol was amended to allow continued monitoring of all patients in a blinded manner for at least an additional 9 months after the last dose of study drug. As part of that objective, study participants were offered MRI scans 12 months after their baseline scan or at their early termination visit, and the results of the measurements derived from those scans are reported here. The design of this Phase IIa study has been described in detail elsewhere, including eligibility criteria, randomization, monitoring, evaluations, follow-up, and ethical conduct (S. Gilman et al., unpublished). Eligible patients were age 50 to 85, met the criteria for a diagnosis of probable AD as defined by the National Institute of Neurological and Communicative Disorders and Stroke/Alzheimer’s Disease and Related Disorders Association criteria,13 and had an MRI brain scan supporting the clinical diagnosis of AD. The study was conducted at 28 centers in five countries between September 2001 and December 2002. Patients were randomly assigned in a double-blind manner to receive treatment with AN1792 225 μg (Elan Pharmaceuticals, South San Francisco, CA) and QS-21 50 μg (Antigenics, Framingham, MA) containing 0.4% polysorbate 80 or normal saline in a 4:1 ratio (figure 1). The assignment code was held by an independent statistician. Patients received only one to three (day 0, months 1 and 3) of the planned six injections because of the premature discontinuation of the study. All patients who had been enrolled in the study could participate in the safety follow-up period, occurring for at least 9 months after their last dose of study treatment. Figure 1. Patient disposition. aOne patient randomized to the placebo group received AN1792/QS-21 owing to a dosing error. The study outcome measures have been described in detail elsewhere (S. Gilman et al., unpublished) and included MRI brain scans performed at baseline and at month 12 or early termination. Patients were imaged on 1.5 T MR units using a standardized protocol; all efforts were made to ensure each follow-up scan was performed on the same scanner using the same imaging protocol as the baseline assessment. Volume measurements were derived from a T1-weighted three-dimensional gradient echo sequence. Exact acquisition parameters varied depending on the scanner manufacturer (see table E-1 on the Neurology Web site at www.neurology.org); all were coronal volumetric acquisitions lasting ≤7.5 minutes (to minimize movement artifact), with the slice (partition) thickness of 1.5 to 1.8 mm adjusted to cover the entire brain, a within-plane field of view of 25 × 25 cm, and an effective matrix size of 256 * 256 * 124. At the baseline visit, each site also performed standard imaging (including T2-weighted or fluid-attenuated inversion recovery sequences) to exclude non-AD pathology. Digitized image data were transferred from each investigational site at the time of scan acquisition. Each scan was checked (blind to treatment allocation) to ensure the MRI site had used the correct protocol and scanner and that the scan was adequate in terms of head coverage, movement, or other artifacts. If necessary, a rescan of the patient was requested. Once both the baseline and the follow-up scan were received and checked, the digitized image data were sent for analysis to the Dementia Research Centre (London, UK). Each individual’s scan pair was registered (positionally matched) and assessed for consistency of acquisition. This step provided further quality assurance, giving a sensitive check that 1) the scans were from the same study subject, 2) both scans adequately covered the whole brain, and 3) there had been no significant change in acquisition. Scans were analyzed on Sun workstations (Sun Microsystems, Mountain View, CA) using the MIDAS image analysis program for image viewing and processing.14 Scans were presented to the measurer in random order, and all analyses were performed blind to any patient details and date of the scans. Measurements of ventricular, hippocampal, and whole-brain volume were made. Intracranial volume was also measured according to a previously described protocol,15 and this was used to normalize for baseline differences in head size between individuals. Whole-brain atrophy was calculated using the brain boundary shift integral (BSI), which determines volume change over the entire three-dimensional brain–CSF interface. This technique has been previously described in detail.16 In brief, the whole-brain region was first extracted from skull, scalp, and other soft tissue using a semiautomated iterative morphologic technique. The brain region was then checked and manually edited where necessary, and from this, an approximate measure of whole-brain volume was calculated. Each scan was then accurately co-registered (positionally matched) to its pair using a 9-df registration technique,17 after which the BSI (a more precise measure of change) was calculated (see figure E-1). Ventricular volumes (lateral ventricles including the temporal horn but excluding the third and fourth ventricles) were measured at baseline, and registered repeat images were performed for each patient using a semiautomated technique. An upper threshold of 60% of mean brain image intensity was applied to separate CSF from brain tissue, followed by manual editing where necessary to delineate the ventricular boundaries. Changes in ventricular volume were then calculated using the BSI applied to the ventricular regions. Hippocampal volumes were manually delineated from each individual’s scan pair. Prior to segmentation, all scans were registered using 6 df to a standard brain template to ensure similar orientation of scans,18 and scan pairs were co-registered using 9 df. Left and right hippocampi were delineated separately from each other and without reference to the results of any other measurements. Tracing of the hippocampal boundaries was performed with each scan of the registered pair viewed side by side to improve consistency. Hippocampal borders were defined using a standard protocol based on neuroanatomic atlases19 and included the CA1 to CA4 regions, the dentate gyrus, and the gray matter of the subiculum.20 The posterior limit of the hippocampus was defined as the coronal slice in which the longest length of the fornix was seen. This measurement method excludes the posterior part of the hippocampal tail to achieve satisfactory reproducibility of segmentation. The rostral border was taken to be at the junction with the amygdala. The hippocampus was bounded superiorly and medially by the ambient cistern, laterally by the temporal horn of the lateral ventricle, and inferiorly by the subjacent white matter. A standard threshold of 60% of mean brain intensity was applied as a lower threshold to remove voxels that were predominantly CSF. Total hippocampal volume (volume of left plus right hippocampus) was used for analysis. Each individual’s registered scan pair was assessed by two independent raters for adequacy and consistency of MR acquisition, with particular attention to problems of movement artifact, adequacy of scan coverage of the head, and change in acquisition between the two scans. Scan pairs were given a grading of unevaluable (unlikely to give a reliable measure of volume change) or evaluable. Any scan pairs with a change that appeared to be due to poor scan pair quality or new pathology (such as major infarcts) and thus might interfere with the volumetric measurements were noted. Sample sizes and power calculations were generated according to the original primary endpoints of the study (S. Gilman et al., unpublished). With respect to MRI measures, the calculation was based on an anticipated mean whole-brain volume change in the placebo group of 2.37%/year with an SD of 1.11%. We estimated that a sample size of 75 patients per group would provide 78% power to detect a 30% change in rate of reduction of whole-brain volume (placebo vs active) using a two-sided test at a significance level of 0.05, based on data previously provided.21 Based on data from a previous Phase I study,22 it was estimated that 25% of patients treated with AN1792/QS-21 would develop an antibody response. Accordingly, 300 patients were planned for enrollment into the active group to yield an estimated 75 patients who would generate an anti-AN1792 antibody response; 75 patients were enrolled into the placebo group. The prespecified efficacy evaluation was conducted on the efficacy-evaluable population rather than on an intent-to-treat basis. The efficacy-evaluable population consisted of antibody responders and placebo-treated patients, that is, 1) all patients injected with AN1792/QS-21 who had a serum anti-AN1792 IgG (total) titer of ≥1:2,200 at any postinjection visit and both baseline and post-injection ADAS-Cog evaluations and evaluable MRI brain scans; and 2) all patients injected with placebo who had both baseline and postinjection ADAS-Cog evaluations and evaluable brain MR scans. With the exception of whole-brain BSI, all derived volumetric data were created such that negative values indicate a decrease from baseline and positive values indicate an increase from baseline. Percentage changes in hippocampal volume were derived by subtracting baseline volume from posttreatment volume and dividing the result by baseline hippocampal volume; percentage change in brain BSI was derived by dividing BSI volume by baseline brain volume. In the case of ventricular BSI volume changes, the denominator was baseline brain volume (i.e., the maximum amount of potential ventricular expansion). All MRI measures were analyzed separately using analysis of variance with treatment, stratum (cholinesterase inhibitor use [yes or no], Mini-Mental State Examination [MMSE] score at screening [15 to 20, 21 to 26], and geographic location [Europe, USA]) as independent variables. Because poor scan quality affects the accuracy of volumetric measurements, patients who had scan pairs of unevaluable quality were excluded from these analyses. The ADAS-Cog, Disability Assessment for Dementia, Clinical Dementia Rating (CDR) Scale, Neuropsychological Test Battery (NTB) subscales, and CSF levels of tau and Aβ42 were analyzed in patients with paired MRI scans using analysis of covariance with change from baseline as the response, baseline value as the covariate, and treatment and stratum (cholinesterase inhibitor use [yes, no], MMSE score at screening [15 to 20, 21 to 26], and geographic location [Europe, USA]) as independent variables. The MMSE was analyzed using the same type model, except that MMSE score at screening was not included as a covariate. The Cochran–Mantel–Haenszel mean score test, stratified by acetylcholinesterase inhibitor use, MMSE score at screening, and geographic location and using equally spaced scores for the ordered levels of the response variable, was used to compare the Alzheimer’s Disease Cooperative Study–Clinical Global Impression of Change distributions for each treatment. Whole-brain BSI was regressed on ventricular BSI separately in antibody responders and placebo-treated patients; the relationship between these volumetric parameters was assessed using the Pearson correlation coefficient, and treatment differences in slopes and intercepts were tested. The relationship between log maximum anti-AN1792 IgG (total) serum titer and MRI volumetric change was assessed in AN1792/QS-21–treated patients who developed a titer of ≥1:100 (i.e., ≥2 × lower limit of assay detection) using the Pearson correlation coefficient and associated test of the null hypothesis that the true correlation was equal to zero. Composite NTB z scores were calculated and analyzed as previously described (S. Gilman et al., unpublished). The composite nine-component NTB z score was regressed on MRI volumetric changes separately in antibody responders and placebo patients, and treatment differences in slopes and intercepts were tested. Of the 27 clinical sites, pooling of MRI sites occurred such that 17 MRI centers participated in the study. A total of 288 of the 372 patients (77.4%) randomized to receive study treatment had MRI scans at baseline and post treatment (active treatment, n = 231; placebo, n = 57). The baseline and demographic characteristics of this MRI safety population were similar between active and placebo groups (table 1), with the exception of a lower mean Rosen–Modified Hachinski Ischemic total score (not clinically meaningful) among patients in the AN1792/QS-21 group compared with placebo recipients. The 288 patients in the MRI population were a representative subsample of the entire 372 patients in the safety population according to a comparison of baseline and demographic characteristics (data not shown). Among the patients who had baseline and posttreatment MRI scans, 204 of 231 patients (88.3%) in the active group and 52 of 57 patients (91.2%) receiving placebo had scans that were evaluable for whole-brain volume. For ventricular volumes, all 231 patients receiving active treatment and 56 of 57 patients (98.3%) in the placebo group had evaluable scans. All patients with paired MRI data had scans evaluable for hippocampal volume. The baseline characteristics of patients with unevaluable scans were not different from those of patients who had evaluable scans for brain or ventricular volume measurements (data not shown). Forty-five of the 231 patients (19.5%) with paired scans in the active treatment group developed a positive antibody response (a serum anti-AN1792 IgG [total] titer of ≥1:2,200 at any time after injection 1). The baseline characteristics of this antibody responder subgroup did not differ from those of placebo patients (see table 1), with the exception of a lower mean baseline Rosen–Modified Hachinski score (p < 0.05) in AN1792/QS-21–treated patients; this difference was not clinically important. Additionally, a higher proportion (p = 0.038) of AN1792/QS-21–treated antibody nonresponders than placebo patients had two APOE ε4 alleles, although there was no difference in homozygous APOE ε4 allele status between antibody responders and placebo patients (p > 0.05). The majority of antibody responders received two injections before the study was halted by the sponsors (37/45 patients [82.2%] in the active group and 51/57 [89.5%] in the placebo group). The mean ± SD MRI scan interval was 10.9 ± 0.9 months for antibody responders and 10.9 ± 1.1 months for the placebo group. There were no differences at baseline in MRI measurements between antibody responders and placebo-treated patients (see table 1). 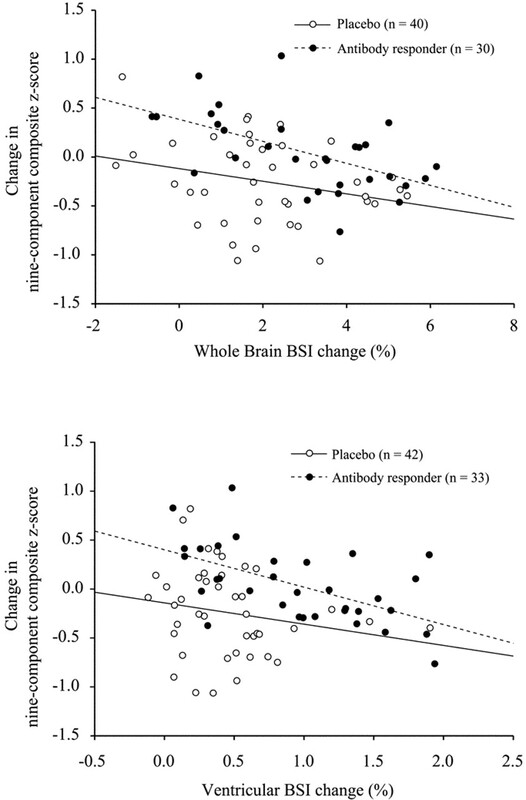 After treatment, the whole-brain BSI change in antibody responders was greater than in the placebo group (p = 0.007), indicating greater brain volume loss in the former group (table 2). Additionally, the ventricular BSI increase (expressed as a percentage of baseline whole-brain volume) was greater in antibody responders than in placebo patients (p < 0.001) (see table 2). The magnitude of change in ventricular BSI was also sufficiently large to be detectable in the intent-to-treat population (all patients injected with either AN1792/QS-21 or placebo who had a baseline and postinjection ADAS-Cog evaluation and MRI brain scan); ventricular BSI change in all patients treated with AN1792/QS-21 (0.64 ± 0.55%, n = 228) was greater than in the placebo group (0.48 ± 0.40%, n = 56; p = 0.027). Hippocampal volume was decreased in both groups after treatment, although the change did not differ significantly between antibody responders and placebo patients (see table 2). Exclusion of patients diagnosed with encephalitis or inclusion of patients with unevaluable scans in the volumetric analyses did not affect the results (data not shown). For comparison, we evaluated volumetric changes in patients who did not achieve the predefined anti-AN1792 responder titer. Volume changes in AN1792/QS-21–treated patients who did not develop a titer of at least 1:1,000 (n = 114) did not differ from those in placebo patients. Mean ± SD volume changes in patients with a titer < 1:100 were 1.9 ± 1.8% loss of whole-brain BSI, 0.46 ± 0.34% ventricular BSI enlargement, and 3.3 ± 2.6% hippocampal volume loss. In patients who developed an intermediate titer (≥1:100 to 1:2,199), mean ± SD volume changes were 2.4 ± 1.7% loss of whole-brain BSI, 0.63 ± 0.49% ventricular BSI enlargement, and 3.7 ± 3.4% hippocampal volume loss. These results suggested that an antibody concentration–response relation was present, and this was evaluated using a correlation analysis. Log anti-AN1792 IgG (total) serum titer was correlated with the percentage change in whole-brain BSI (Pearson correlation coefficient r = 0.293, p = 0.003) and with ventricular BSI changes (r = 0.472, p < 0.0001) in treated patients who developed a titer of ≥1:100 (≥2 × lower limit of assay detection) (figure 2). That is, greater volumetric changes from baseline were associated with higher IgG antibody titers. No correlation existed between hippocampal volume change and antibody titer (Pearson correlation coefficient r = −0.046, p = 0.629). Figure 2. Correlation of volumetric changes to log serum anti-AN1792 IgG (total) titer in patients treated with AN1792/QS-21. (A) Whole-brain boundary shift integral (BSI). Pearson correlation coefficient r = 0.293, p = 0.003, n = 100. (B) Ventricular BSI. Pearson correlation coefficient r = 0.472, p < 0.0001, n = 114. (C) Hippocampal volume. Pearson correlation coefficient r = −0.046, p = 0.629, n = 113. Patients were included in the analysis if they had evaluable paired MRI scans and developed a titer of ≥1:100 (≥2 × lower limit of assay detection). Data presented are the reciprocal of the log titer. Positive changes from baseline in whole-brain BSI indicate a decrease in volume. Ventricular BSI changes are expressed as a percentage of baseline whole-brain volume. 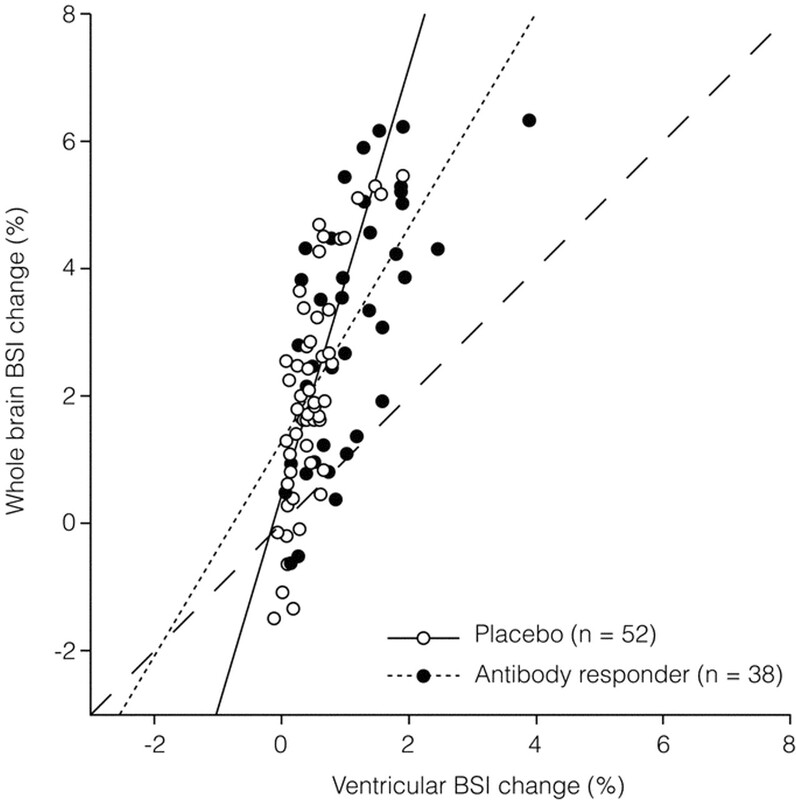 Correlations were observed between whole-brain BSI and ventricular BSI in antibody responder and placebo groups (p < 0.0001) (figure 3). The relationship between brain volume loss and ventricular enlargement was different between groups; the magnitude of whole-brain BSI loss per unit of ventricular BSI enlargement was less in antibody responders than in placebo patients (difference in slopes, p = 0.0025). Figure 3. Relationship between change in whole-brain volume boundary shift integral (BSI) and change in ventricular BSI in the MRI efficacy-evaluable population. Patients were included in the analysis if they had evaluable paired MRI scans. Patients were considered antibody responders if they had a serum anti-AN1792 IgG (total) titer of ≥1:2,200 at any time after injection 1. Positive changes from baseline in whole-brain BSI indicate a decrease in volume. Ventricular BSI changes are expressed as a percentage of baseline whole-brain volume. The dashed line indicates the line of equivalence at which the unit change in ventricular BSI is equal to the unit change in whole-brain BSI. Difference in slopes: p = 0.0025. There were eight cases of encephalitis in AN1792/QS-21–treated patients with paired MRI scans. One patient had active encephalitis at the time of the second scan, as indicated by hippocampal (7.9%) and whole-brain (−6.7%) volume increase with ventricular volume decrease (−0.5%) compared with baseline. In the remaining seven patients, the encephalitis was no longer active at the time of the second scan, and hippocampal and brain volume losses and ventricular enlargement relative to baseline were observed. For these seven patients, the range of changes was 1.1 to 6.2% (indicating a decrease in volume) for brain BSI, 1.1 to 2.5% for ventricular BSI, and −2.2 to −5.7% for hippocampal volume. Clinical outcomes in the subgroup of patients with paired evaluable MRI scans were similar to those reported in the entire study cohort (n = 372) (S. Gilman et al., unpublished). Cognitive, disability, and global change scores declined from baseline in antibody responders and in placebo-treated patients during the course of the study follow-up period (see table E-2). There were no significant differences between treatment groups in any of these exploratory measures. Analysis of the nine-component composite NTB z score indicated less worsening in antibody responder patients than in the placebo group at month 12 (p = 0.008) (see table E-3). Examination of the subgroups of the overall composite NTB z score indicated that the treatment difference between antibody responder and placebo patients was also observed in the all memory (p = 0.014), immediate memory (p = 0.028), and delayed memory (p = 0.047) composite z scores. In each individual NTB, antibody responders tended to perform better than placebo patients at month 12 (see table E-3), although the difference between groups was significant only for the Rey Auditory Verbal Learning–Immediate Test (p = 0.014). The relationships between the nine-component composite NTB z score and whole-brain BSI and ventricular BSI volume change are shown in figure 4. The results indicate that despite the generally greater loss of whole-brain volume and increase in ventricular size among the antibody responder group, antibody responders maintained a cognitive advantage on neuropsychological testing compared with placebo patients. For each of the three nine-component composite NTB z score vs volumetric measure relationships, regression analyses indicated no significant differences in slopes between antibody responder and placebo groups. Figure 4. Relationship between brain volumetric changes and the nine-component composite Neuropsychological Test Battery z score in antibody responder and placebo patients. Patients were included in the analysis if they had evaluable paired MRI scans. Patients were considered antibody responders if they had a serum anti-AN1792 IgG (total) titer of ≥1:2,200 at any time after injection 1. Positive changes from baseline in whole-brain boundary shift integral (BSI) indicate a decrease in volume. Ventricular BSI changes are expressed as a percentage of baseline whole-brain volume. Changes in CSF findings in the subset of patients who had baseline and postbaseline CSF samples for patients with paired MRI scans were similar to changes reported in the overall study population (S. Gilman et al., unpublished). In the population with paired MRI scans, CSF tau protein (mean ± SD) was reduced in antibody responders compared with baseline (−204 ± 58 pg/mL; n = 11), and the reduction was greater than in the placebo group (38 ± 54 pg/mL; n = 9, p = 0.001). Treatment with AN1792/QS-21 had no effect on CSF levels of Aβ42 (p = 0.491). Analyses to explore the potential moderating effects of APOE ε4 allele status on the observed treatment effects in the cognitive and MRI outcomes were conducted in the MRI population. As in the entire study cohort (S. Gilman et al., unpublished), none of the main effects or treatment-by-ε4 allele status interactions was significant in the MRI sample (all p > 0.1), indicating that APOE ε4 allele status does not explain the MRI volumetric changes. This is the first study to assess the effects of Aβ immunotherapy on MRI measures of cerebral volume in AD. As the active phase of the trial was terminated prematurely because of the development of meningoencephalitis in 6% of treated patients,12 only two MRI scans were obtained rather than the three originally planned at 0, 12, and 15 months. We found highly significant MRI volumetric changes, despite the reduction in power from the truncated study duration and the resulting lower percentage of patients achieving the predefined antibody response to AN1792/QS-21 and increased dropouts. Counter to expectations, whole-brain volume loss and ventricular volume enlargement were significantly greater among antibody responders than placebo-treated patients by a factor of 1.5 for brain volume reduction (3.1 vs 2.0%) and a factor of 2 for ventricular volume increase (1.1 vs 0.5%, equivalent to 11.1 vs 4.5 mL of absolute ventricular volume change). After the data were annualized (observed changes adjusted for the mean scan interval of 10.9 months), the rates of brain loss (about 2.2%/year) and ventricular enlargement (about 0.6% or 5 mL/year) in the placebo group were similar to those in previous longitudinal studies of AD that demonstrate brain atrophy rates of about 2 to 2.5%/year21,23,24 and ventricular enlargements of 5 to 8 mL/year.5,24–26 However, in contrast to the placebo group, the antibody responders had mean rates of brain and ventricular change that were outside the range of findings from previous studies. The annualized rate of hippocampal volume loss in the antibody responder group (about 4.2%/year) was greater than in the placebo group (about 3.1%/year), although these differences were not statistically different. Both groups had rates of hippocampal atrophy that were within the wide range of those previously reported in the literature. Reported rates of hippocampal volume change vary from about 3 to 9%/year,4,5,27,28 possibly because of different measurement techniques or differences between patient populations. These highly significant differences in brain and ventricular changes cannot be easily attributed to baseline differences between the study groups. In particular, the responder and placebo groups were similar in terms of measures of disease severity (mean MMSE 20.8 vs 20.2) and baseline brain volume as a percentage of total intracranial volume (69.4 vs 69.4%). This is relevant, as rates of brain atrophy have been shown to increase as AD progresses.29 The groups were also similar in terms of baseline acetylcholinesterase inhibitor, vitamin E use, and APOE status. The differences between antibody responders and placebo groups also cannot simply be explained by postulating that individuals with pre-existing higher rates of atrophy at baseline were more likely to develop antibodies against AN1792/QS-21. The fact that the magnitudes of brain and ventricular volume changes were similar (and not significantly lower) in those treated with AN1792/QS-21 who developed negligible or very low antibody levels compared with placebo-treated patients argues strongly against the idea that antibody response was “selecting out” individuals with higher rates of loss. Furthermore, there was still a significant difference in ventricular enlargement in the intent-to-treat analysis when all AN1792/QS-21–treated patients were compared with those in the placebo group. It is a measure of the strength of the effect that this comparison still reached significance, given that the majority of the AN1792/QS-21 group (>80%) did not generate the prespecified level of antibodies to be considered antibody responders. All these significant differences were still apparent after excluding the cases of encephalitis from the statistical analyses. Systematic changes in MR acquisition between baseline and follow-up scanning can produce anomalous results; however, every site had both patients randomized to placebo and treated patients who did not develop a measurable antibody titer as well as antibody responders. All the subjects had scans over short time intervals, and it appears highly unlikely that any potential scanner bias would have affected just the antibody responders. The registration-based analyses were designed to provide increased measurement precision.5,6,16,17 However, they also provided an additional level of quality assurance in that each scan pair was checked for changes in acquisition. It therefore seems very unlikely that the differences between the groups seen on MRI could have been due to statistical anomaly, measurement bias, baseline imbalance, or the clinical encephalitis cases. Furthermore, there was a strong “concentration–response” relationship between immunologic response (anti-AN1792 antibody levels) and brain or ventricular changes within the AN1792/QS-21–immunized group with measurable titers; individuals with higher antibody titer had greater volume changes in a monotonic relationship. There are a number of alternative explanations that might account for the increased brain volume loss and ventricular enlargement in the antibody responder group. The first possibility is that anti-AN1792 antibodies caused an acceleration in neuronal loss above that inherent in AD. As a proportion of patients with high antibody levels developed clinically apparent meningoencephalitis, it is conceivable that an unrecognized subclinical encephalitis, leading to increased neuronal destruction, could have been present in other patients. However, this is an unlikely explanation for the sizeable volume differences, as the antibody responders did not show increased cognitive decline compared with the placebo group. Indeed, on a battery of cognitive tests, the composite NTB, antibody responders showed less decline than placebo-treated patients. Clinical outcomes in the subgroup of patients with paired evaluable MRI scans were similar to those reported in the entire study cohort (S. Gilman et al., unpublished). The second possibility is that the observed differences in volume changes were related to removal of amyloid plaques from within the brain. Amyloid plaque removal was an aim of the therapy and a postulated mechanism of action based on theoretical grounds and the results of experiments on animal models.30 Furthermore, there does appear to be evidence of amyloid removal in a small number of patients with AD who have received AN1792/QS-21 and have come to postmortem examination.31–33 It is difficult to estimate the magnitude of brain volume change that might be expected from amyloid plaque removal alone. Autopsy work using stereologic techniques suggests that in moderately severe AD (CDR ≥ 2), plaques occupy about 9% of the volume of some cerebral regions (e.g., subiculum or entorhinal cortex).34,35 One study estimated amyloid load at 4 to 11% of frontal and temporal cortices in seven unimmunized AD patients and contrasted this with much lower levels (<0.5%) found in the temporal lobe of an AD patient immunized with AN1792.31 Although amyloid plaques are very widely distributed throughout the Alzheimer brain, it is unclear whether amyloid removal alone could account for the observed large volume changes. It is possible that the observed brain volume changes were due to neither increased neuronal cell damage or death nor the direct removal of amyloid. Alternative explanations might include dispersal of other nonamyloid plaque-related proteins or alterations in glial cell density, both of which might additionally be associated with fluid shifts from brain parenchyma to CSF spaces. Mobilization of amyloid per se might also result in fluid shifts, either directly in association with amyloid removal or perhaps mediated via alterations in CSF flow dynamics, that is, changes in CSF reabsorption. Aging and AD are both associated with increased CSF outflow resistance and marked meningeal amyloid deposition.36,37 If mobilization of amyloid produced an increase in CSF outflow resistance, perhaps due to antibody–amyloid complexes at sites of CSF reabsorption, this could have contributed to increased ventricular enlargement and reduced brain volume in the antibody responders. Further evidence to suggest that excess neurodegeneration might be unlikely to account for the volume changes comes from the CSF tau results. CSF tau levels are known to be increased in AD and in other causes of neuronal destruction (including encephalitis).38 However, in the small subgroup of patients that had CSF analyzed at baseline and follow-up, mean CSF tau levels fell relative to baseline in the antibody responder group by about 28% (by 204 ± 58 pg/mL from a mean baseline level of 740 ± 243 pg/mL). A decline in CSF tau of this magnitude is unlikely to be due simply to a dilutional effect of the increased CSF volume. Furthermore, CSF levels of Aβ42 did not fall in the responder group, and CSF volume increased in the placebo group without a reduction in CSF tau. All of the theoretical explanations listed above could potentially have coexisted in this study: namely, that there were some unrecognized cases of subclinical encephalitis and that some of the volume changes were directly due to amyloid removal and some indirectly due to fluid shifts into CSF spaces. Attempts to synthesize these possibilities must explain the dissociation between the antibody responder group having reduced cognitive decline despite increased brain volume loss and ventricular enlargement. Thus, if cases of subclinical encephalitis were responsible for the increased brain volume decreases due to increased neuronal loss, some beneficial effect, perhaps of amyloid removal, must have outweighed any cognitive effects of the encephalitis. These results provide a reminder that MRI can provide complementary information on the effects of therapy but, as with other biomarkers, can offer only an indirect measure of disease progression. Markers that appear to track progression closely in untreated cases may not necessarily do so in the presence of a treatment, at least not over the short term. Furthermore, it may be difficult to interpret the time course and nature of brain volume changes if based on MRI at only two time points. The study was originally planned with a third MRI scan and longer clinical follow-up; both would have been helpful in better understanding the effects of AN1792/QS-21 immunotherapy. This trial has raised as many challenges as possibilities: How to avoid meningoencephalitis while maximizing potential clinical benefit with future immunotherapy is the most pressing; an understanding of the mechanisms underlying the observed brain volume changes in this trial is another. The authors thank Josephine Barnes, Shona Price, Valerie Anderson, Basil Ridha, Jennifer Whitwell, and Rachael Scahill (Dementia Research Centre, Queen Square, London, UK) for performing the image analyses. Christoph Hock (University of Zurich, Switzerland) also served as an investigator in this study. The AN1792(QS-21)-201 Study Team principal investigators are as follows: Rafeal Blesa (Hospital San Pablo y Santa Cruz, Barcelona, Spain), Mercè Boada Rovira (Fundació ACE, Institut Català de Neurociències Aplicades, Barcelona, Spain), Jody Corey-Bloom (Alzheimer’s Disease Research Center, La Jolla, CA), Jean-François Dartigues (Hôpital Pellegrin–Tripode, Bordeaux, France), Rachelle Doody (Baylor College of Medicine, Houston, TX), Bruno Dubois (Hôpital La Pitié Salpêtrière, Paris, France), Larry Eisner (Baumel-Eisner Neuromedical Institute, Fort Lauderdale, FL), Stephen Flitman (Xenoscience Inc., Phoenix, AZ), Françoise Forette (Hôpital BROCA–La Rochefoucauld, Paris, France), Ana Frank Garcia (Hospital Universitario La Paz, Madrid, Spain), Daniel Grosz (Pharmacology Research Institute, Northridge, CA), Pierre Jouanny (Hôtel Dieu–CHU, Rennes, France), Louis Kirby (Pivotal Research Centers, Peoria, AZ), Bernard Laurent (Hôpital Bellevue, Saint-Etienne, France), Bernard Michel (Hôpital Sainte-Marguerite, Marseille, France), Florence Pasquier (Hôpital Roger Salengro, Lille, France), Jordi Pena-Casanova (Hospital del Mar, Barcelona, Spain), Ronald Petersen (Mayo Clinic, Rochester, MN), José Manuel Ribera Casado (Hospital Clinico San Carlos, Madrid, Spain), Ralph Richter (Clinical Pharmaceutical Trials, Inc., Tulsa, OK), Martin Rossor (National Hospital for Neurology and Neurosurgery, London, UK), Jacques Touchon (Hôpital Gui de Chaulliac, Montpellier, France), Bruno Vellas (CHU La Grave–Casselardit, Toulouse, France), and Parvaneh Zolnouni (CA Clinical Trials, Beverly Hills, CA). Additional material related to this article can be found on the Neurology Web site. Go to www.neurology.org and scroll down the Table of Contents for the May 10 issue to find the title link for this article. *See the Appendix for a list of Group members. Sponsored by Elan Pharmaceuticals, Inc., and Wyeth Research. N.C.F. holds a Medical Research Council Senior Clinical Fellowship. Drs. Fox and Rossor have received honoraria from Elan Pharmaceuticals, Inc., and Wyeth Research. Dr. Gilman served as chair of the Safety Monitoring Committee for the trial and received payment from Elan Pharmaceuticals, Inc., only for his time reviewing safety data. Drs. Griffith and Koller are employees of Elan Pharmaceuticals, Inc., and hold equity in its parent company, Elan Corporation plc. Drs. Jenkins and Black are employees of, hold equity in excess of $10,000 in, and have received honoraria in excess of $10,000 from Wyeth Research. Presented in part at the Ninth International Conference on Alzheimer’s Disease, July 17 to 22, 2004, Philadelphia, PA. Received August 12, 2004. Accepted in final form January 31, 2005. Braak H, Braak E. Neuropathological stageing of Alzheimer-related changes. Acta Neuropathol (Berl) 1991;82:239–259. Scarpini ESPFH. Treatment of Alzheimer‘s disease: current status and new perspectives. Lancet Neurol 2004;2:539–547. Black SE. The search for diagnostic and progression markers in AD: so near but still too far? Neurology 1999;52:1533–1534. Jack CR Jr, Slomkowski M, Gracon S, et al. MRI as a biomarker of disease progression in a therapeutic trial of milameline for AD. Neurology 2003;60:253–260. Jack CR Jr, Shiung MM, Gunter JL, et al. Comparison of different MRI brain atrophy rate measures with clinical disease progression in AD. Neurology 2004;62:591–600. Ashburner J, Csernansky JG, Davatzikos C, Fox NC, Frisoni GB, Thompson PM. Computer-assisted imaging to assess brain structure in healthy and diseased brains. Lancet Neurol 2003;2:79–88. Matthews B, Siemers ER, Mozley PD. Imaging-based measures of disease progression in clinical trials of disease-modifying drugs for Alzheimer disease. Am J Geriatr Psychiatry 2003;11:146–159. Mani RB. The evaluation of disease modifying therapies in Alzheimer’s disease: a regulatory viewpoint. Stat Med 2004;23:305–314. Braak H, Braak E. Staging of Alzheimer‘s disease-related neurofibrillary changes. Neurobiol Aging 1995;16:271–278. Scahill RI, Schott JM, Stevens JM, Rossor MN, Fox NC. Mapping the evolution of regional atrophy in Alzheimer’s disease: unbiased analysis of fluid-registered serial MRI. Proc Natl Acad Sci USA 2002;99:4703–4707. Mortimer JA, Gosche KM, Riley KP, Markesbery WR, Snowdon DA. Delayed recall, hippocampal volume and Alzheimer neuropathology: findings from the Nun Study. Neurology 2004;62:428–432. Orgogozo J-M, Gilman S, Dartigues J-F, et al. Subacute meningoencephalitis in a subset of patients with AD after Aβ42 immunization. Neurology 2003;61:46–54. Freeborough PA, Fox NC, Kitney RI. Interactive algorithms for the segmentation and quantitation of 3-D MRI brain scans. Comput Methods Programs Biomed 1997;53:15–25. Whitwell JL, Crum WR, Watt HC, Fox NC. Normalization of cerebral volumes by use of intracranial volume: implications for longitudinal quantitative MR imaging. AJNR Am J Neuroradiol 2001;22:1483–1489. Freeborough PA, Fox NC. The boundary shift integral: an accurate and robust measure of cerebral volume changes from registered repeat MRI. IEEE Trans Med Imag 1997;16:623–629. Freeborough PA, Woods RP, Fox NC. Accurate registration of serial 3D MR brain images and its application to visualizing change in neurodegenerative disorders. J Comput Assist Tomogr 1996;20:1012–1022. Mazziotta JC, Toga AW, Evans A, Fox P, Lancaster J. A probabilistic atlas of the human brain: theory and rationale for its development. The International Consortium for Brain Mapping (ICBM). Neuroimage 1995;2:89–101. Duvernoy HM. The human hippocampus. 2nd ed. Heidelberg: Springer-Verlag, 1998. Watson C, Andermann F, Gloor P, et al. Anatomic basis of amygdaloid and hippocampal volume measurement by magnetic resonance imaging. Neurology 1992;42:1743–1750. Fox NC, Cousens S, Scahill R, Harvey RJ, Rossor MN. Using serial registered brain magnetic resonance imaging to measure disease progression in Alzheimer disease. Arch Neurol 2000;57:339–344. Bayer AJ, Bullock R, Jones RW, et al. 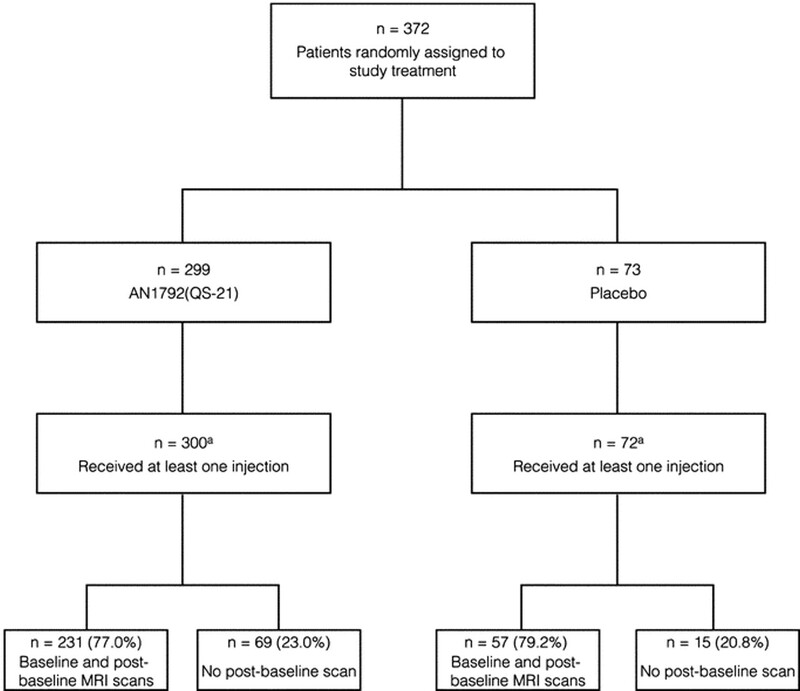 Evaluation of the safety and immunogenicity of synthetic Aβ42 (AN1792) in patients with AD. Neurology 2005;64:94–101. O’Brien BJ, Paling S, Barber R, et al. Progressive brain atrophy on serial MRI in dementia with Lewy bodies, AD, and vascular dementia. Neurology 2004;56:1386–1388. Wang D, Chalk JB, Rose SE, et al. MR image-based measurement of rates of change in volumes of brain structures. Part II: application to a study of Alzheimer’s disease and normal aging. Magn Res Imag 2002;20:41–48. Shear PK, Sullivan EV, Mathalon DH, et al. Longitudinal volumetric computed tomographic analysis of regional brain changes in normal aging and Alzheimer‘s disease. Arch Neurol 1995;52:392–402. Silbert LC, Quinn JF, Moore MM, et al. Changes in premorbid brain volume predict Alzheimer’s disease pathology. Neurology 2003;61:487–492. Du AT, Schuff N, Kramer JH, et al. Higher atrophy rate of entorhinal cortex than hippocampus in AD. Neurology 2004;62:422–427. Mori E, Lee K, Yasuda M, et al. Accelerated hippocampal atrophy in Alzheimer’s disease with apolipoprotein E epsilon4 allele. Ann Neurol 2002;51:209–214. Chan D, Janssen JC, Whitwell JL, et al. Change in rates of cerebral atrophy over time in early-onset Alzheimer’s disease: longitudinal MRI study. Lancet 2003;362:1121–1122. Schenk D, Barbour R, Dunn W, et al. Immunization with amyloid-β attenuates Alzheimer-disease-like pathology in the PDAPP mouse. Nature 1999;400:173–177. Nicoll JAR, Wilkinson D, Holmes C, Steart P, Markham H, Weller RO. Neuropathology of human Alzheimer disease after immunization with amyloid-β peptide: a case report. Nat Med 2003;9:448–452. Ferrer I, Boada Rovira M, Sanchez Guerra ML, Rey MJ, Costa-Jussá F. Neuropathology and pathogenesis of encephalitis following amyloid-beta immunization in Alzheimer’s disease. Brain Pathol 2004;14:11–20. Masliah E, Hansen L, Adame A, et al. Abeta vaccination effects on plaque pathology in the absence of encephalitis in Alzheimer’s disease. Neurology 2005;64:129–131. Bussiere T, Friend PD, Sadeghi N, et al. Stereologic assessment of the total cortical volume occupied by amyloid deposits and its relationship with cognitive status in aging and Alzheimer’s disease. Neuroscience 2002;112:75–91. Colle MA, Duyckaerts C, Laquerriere A, et al. Laminar specific loss of isocortical presenilin 1 immunoreactivity in Alzheimer’s disease. Correlations with the amyloid load and the density of tau-positive neurofibrillary tangles. Neuropathol Appl Neurobiol 2000;26:117–123. Silverberg GD, Mayo M, Saul T, Rubenstein E, McGuire D. Alzheimer’s disease, normal-pressure hydrocephalus, and senescent changes in CSF circulatory physiology: a hypothesis. Lancet Neurol 2003;2:506–511. Hamano T, Yoshimura M, Yamazaki T, et al. Amyloid beta-protein (A beta) accumulation in the leptomeninges during aging and in Alzheimer disease. J Neuropathol Exp Neurol 1997;56:922–932. Blennow K, Hampel H. CSF markers for incipient Alzheimer’s disease. Lancet Neurol 2003;2:605–613.